Now that you got a look at all the yummies, let’s jam with my two projects….both with very different coloring techniques! I have a video today for this first card – I used distress inks with the Mondo Poinsettia stamp set and matching die set! In the video you’ll see a few tricks to help make your watercoloring a little easier…I discovered that leaving my diecut in place in the paper it’s cut from helped to keep it still as well as serving as a palette! Watch the video below or click HERE to see it in HD on YouTube. I’m excited to start playing around with foil in coming months as the holiday season is rolling around…I kinda skipped it when everyone else got their laminators, even though I have one. I figured I’d save myself a new technique to play with for Christmas! 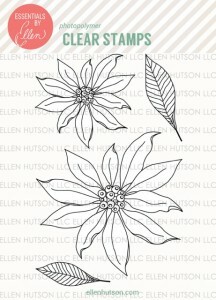 Mondo Poinsettia stamp set and matching die set! Are you ready for another card after all that sweet watercoloring? Let’s jump over to another season: halloween! Subscribe to my blog by clicking HERE (and read a little about the free gift I give to my new subbies!)…. And/or subscribe to my YouTube channel. And, yay!!! I also get to give this new stamp set, Mondo Poinsettia to a lucky someone! Please leave a comment to enter my giveaway! Happy hoppin’! Your next stop is the oh-so-talented Laurel! Sandy Allnock <—you are here! OMG, this watercolor flower series just gets better!!! Another gorgeous card! I will have to try these techniques, thank you for the inspiration and sharing your experiences and gift with us! I need all those stamps for sure. Your coloring is amazing!! Sandy, I am just in awe of your talent! These 2 sets are my favorite. I love your cards. Can’t wait to try your techniques. Thanks for sharing! You used my favorite stamp on this release, and how beautifully you color them! I love, love your card. TFS and for the coloring tips. I appreciate your sharing your ideas for these new stamp sets. The first card is the last word in elegance! And the second is so bright and cheerful! Absolutely amazing work! Wonderful coloring…thanks for the tips!! Can’t wait to see your pumpkin patch video! Wow! I love that poinsettia card, Totally gorgeous! Absolutely gorgeous!!!! What a fantastic technique; love everything about your card and the touch of shimmer! Thanks fro the thechnique video and all the tips, looking forward to watch the pumpking coloring video too! TFS! You’ve made two gorgeous cards! The poinsettias look so real … as if you’ve attached live plants on the card. Love it! Gorgeous flowers and super cute pumpkin patch! Your coloring is fabulous, Sandy, and great video, too! Love the Fall colors ~ pumpkins and all ~ but I don’t care for some of the weird sentiments either. Thanks for the chance to win Mondo Poinsettia! What a gorgeous winter card!!! So elegant! What a gorgeous card. Love it. The poinsettia card is so elegant and the Halloween one so fun. Love them! Your white poinsettias are gorgeous. I have always been partial to the white and I love your Halloween card. I always enjoy your videos. I learn so much, thank you! Beautiful cards! My parents had white poinsettias at their wedding since they married on Dec. 23. I’d love to try this technique for their 64th anniversary card. I’m sure the Wink of Stella makes it just gorgeous! Stunning Card! I cant wait to try and duplicate it! This card is absolutely stunning!!!! Wonderful products and wonderful ideas. LOVE your card! Awesome coloring and the gold foil is perfect! you have such an amazing talent! Great cards – especially the pumpkin patch! Oh my goodness! I am in awe of how beautiful thos poinsettias are. As always your cards amaze me! I enjoyed the white poinsettia video since I struggle with coloring white images. Cute pumpkin patch and love the white poinsettias. LOve your unusual white poinsettia and thanks for the video. Love, love, love your cards!